My best family vacation: Sunriver, OR but I’m hoping our upcoming trip with the kids to Israel will be! This is one of my all time favorite quotes. Great teachers teach because they love learning and not just because they love being an expert. They recognize that they are not all-knowing. 2.) Personal. My favorite teachers are ones who really see me for who I am and how I learn. They make the lesson personal, approachable, and meaningful. I will never forget being in a yoga class when the teacher recited all 15+ of our names during seated meditation. Hearing my name amongst the others was a clear indicator that this teacher really cared about each of us and our personal journey to health and well-being. 3.) Magnetic. Teachers who love what they do and exude this energy, automatically draw students in. Just ask my son. He is in Kindergarten and has bloomed this year. He is a passionate and engaged learner largely because he is basking in the light of a very magnetic teacher. 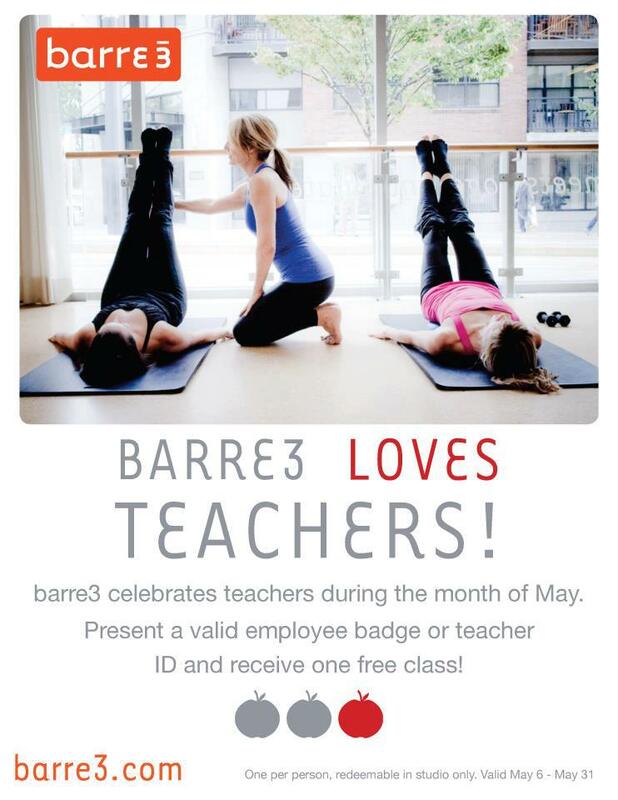 I often choose barre3 instructor-trainees based on their love for barre3 and how they express their dedication to helping others versus their technical skills. I think a good teacher is 10% technical and 90% energy. So here’s to all the many open minded, personal, and magnetic teachers out there. I heart you! Teachers, contact your studio to come in and enjoy 60 minutes for you. You will be in good company I promise! I am so fortunate to be able witness some of my key team members become Moms for the first time. I recently interviewed Lisa Schale-Drake who runs my instructor training program and stars in our latest www.mybarre3.com release, a 30 minute pre-natal workout. Read on to find out what makes Lisa a “fierce” mom-to-be of twins. Q: First off congrats on being pregnant with TWINS! You are an amazing multi-tasker so I have a feeling you will be equally amazing with a babe in each arm. Speaking of… are there any barre3 postures that will help you hold them better? A: So many! I love any posture that works the back body. I love Incline Chair because it works my biceps and strengthens the entire back line of my body. I have a feeling I will need some strong biceps to pick up two car carriers. They are surprisingly heavy! Q: At least your arms will be equally buff with two carriers! What is the most surprising thing about being pregnant and exercising? A: It amazes me how quickly the body adjusts and changes. I looked back at a picture of me from just a few weeks ago and I am shocked by how much I have grown! However, I am also shocked by how little I feel pain in my body. I really do believe that working out and listening to my body has been key. Q: What is the most challenging part of doing barre3 while pregnant? A: Breathing! My soon to be girl loves to push on my ribcage, so I always feel short of breath. Q: Have you noticed any shifts in how you approach fitness and specifically barre3 now that you are expecting twins? A: Most definitely! I have noticed that going slower and taking more breaks is key. I am trying to listen and honor my body and modify if it doesn’t feel right. There are many postures that I miss doing, but I know that it is for the best for my babies and me. Q: Listening to your body is a real gift. Pregnant or not, we can all learn from this! I like that you mentioned modifying. I’ve noticed even you slowing down. Can you speak more about this? A: The reality is that I am working out for three! Once I decided to stop trying to be turbo and instead decided to slow down, I was able to connect to the needs of my body much easier. Now I can come to class and still get my shakes on during leg and seat, but find a sense of ease and release during core. It is a great balance. Q: I’m glad you are finding balance. This is my big goal for moms at barre3! Can you explain in your words how barre3 supports moms-to-be? A: The community is so supportive and inviting. I have had so many clients who are moms giving me great advice on baby products. The instructors always take such good care of me. And, I can’t wait to show off my twins in the childcare area. 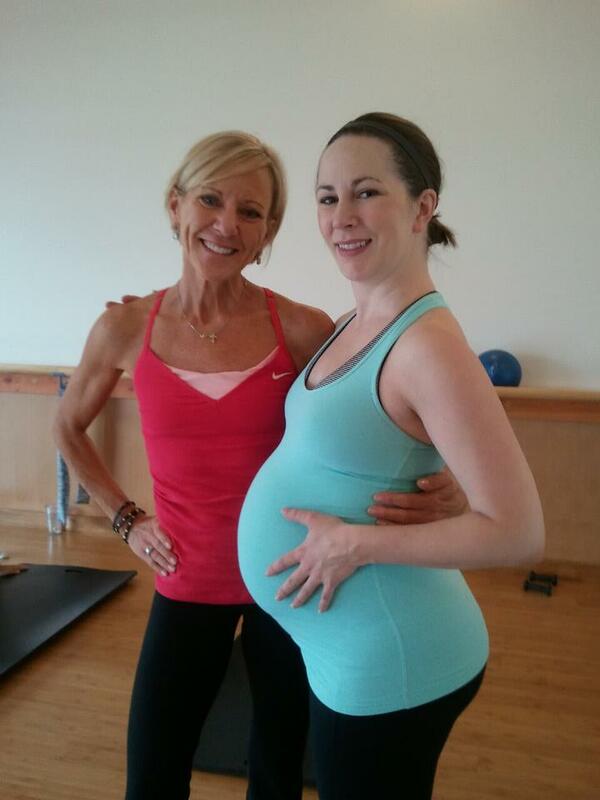 barre3 Instructor, Darcy Harding (left) joined a full class to celebrate Lisa’s send off before having her twins. Q: Someone on Facebook recently commented on your new pre-natal workout and called you “officially the fiercest mom I know”. I found this definition for fierce: Showing a heartfelt and powerful intensity. I couldn’t agree more with this description of you and I look forward to hearing from all the other fierce moms-to-be after doing your workout! A: Love that! I hope I live up to my new title once the twins are born. Q: Any other comments or advice you would like to share to all of our moms-to-be? barre3 franchise partners, Heather Kass (left) and Anna McEvers at barre3 Bellevue Studio. 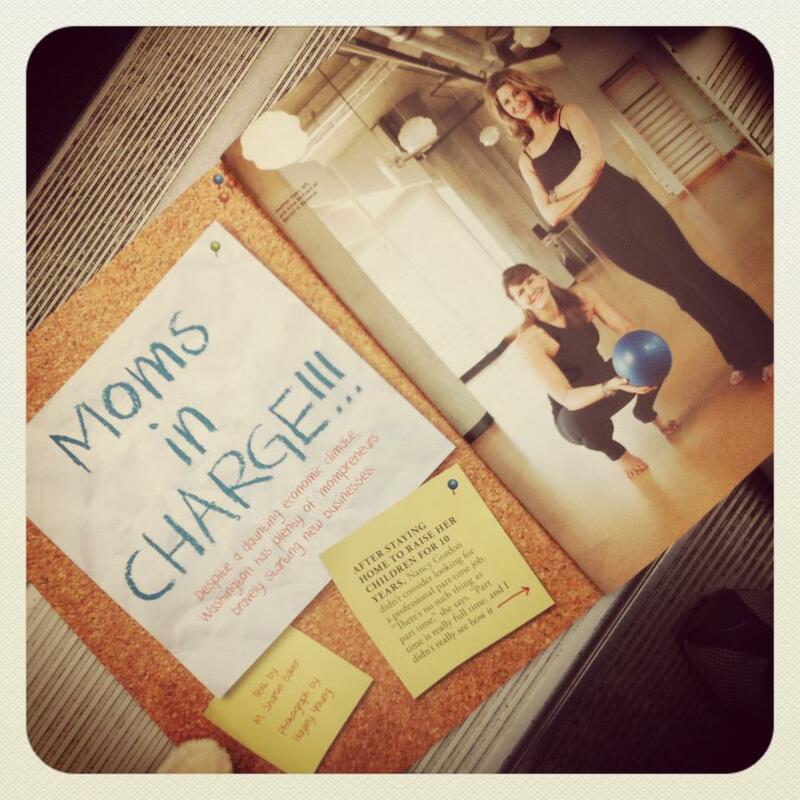 At barre3 we celebrate Moms in a big way. This month in honor of Mothers Day we have a bunch planned including tributes, tips, giveaways, and workouts designed for all moms and moms-to-be. I began my passion for yoga watching my mom practice in her bedroom when I was five years old. A few years later I was equally inspired watching her bravely create the Eugene Weekly (during a recession in the 80’s) right in our living room. I drew pictures to fill up ad space for the first issues! 35 years later I have created my own company around imprinting a healthy and balanced lifestyle for my children and the generations after. I am not alone! There are many “Moms in Charge” who are re-shaping how we define work/home balance and being healthy hands-on parents. Here are two of them, Anna McEvers and Heather Kass, who own three barre3 studios in the Seattle area. A good read for all mompreneurs! Try the barre3 “barre” recipe! 4 years of barre3 and my big 4-0!